Its valley is bounded by sheer mountain cliffs, towering falls, and a forested valley floor. The combined scene is one of nature's most inspired creations. These are the attractions in Yosemite National Park that impress visitors the most. Each is described below. 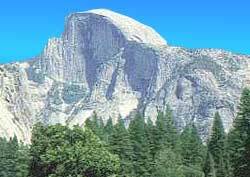 The icon of Yosemite National Park (see photo). Tip: It's best photographed in the afternoon sun. This steep-sided peak soars almost 1,100 meters (nearly 3,600 feet) above the Yosemite National Park valley floor. The 188-meter (620-foot) high Bridalveil Falls gained its name because winds push its falling water around, creating a plunging gossamer spray. It is one of the world's highest falls, the equivalent of a modern 240-story building. Although it appears to be a single entity, it is a combination of three sequential falls. This the home of Giant Sequoias, the world's biggest and oldest botanical life form. One sequoia tree is 2,700 years old, dating back to the seedling days of the Roman Empire.